Penrith Futures is a networking group for young professionals. The group has about 25 attendees and meets quarterly. The events are made fun and interactive with learning involved. We have in the past organised events such as team building exercises and seminars on social media and networking. We wanted to hold a fundraising event for Eden Valley Hospice which was different, entertaining and would also get a number of firms involved in the Penrith area. The game ‘the Cube’ was suggested and we all really liked the idea. The event was held at Penrith Cricket Club who kindly allowed us to use their room free of charge. 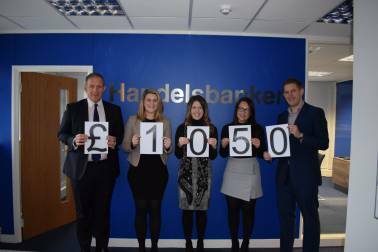 Richard Lancaster from Handelsbanken kindly agreed to be our Philip Schofield and on the evening he did an amazing job in commentating on the games and entertaining the audience. In total six local firms entered contestants who battled against each other to win the trophy. The Penrith Futures team was the winning team on the evening and the trophy was awarded to Mandy Shum of Cartmell Shepherd. We hope to hold the event again next year as it has been such a success and talked about a lot in our offices! We are very proud of the success of the games evening but we wouldn’t have been able to do it without the support from our firms, sponsors, local businesses and competitors. We asked local firms if they would be willing to provide raffle prizes and we were overwhelmed with the response we received. Eden Valley Hospice does an amazing job and we wanted to show our support in continuing the good work it does in the community.